When the ocean swallows their homeland, the survivors of five nations take to the ocean to look for new land, but their common plight isn't enough to stop the growing war between them. As King Echad's illness worsens, Sâr Wilek takes authority over the expedition and struggles to rule the disjointed people while Prince Trevn sets his sights on learning to captain a great ship. Meanwhile, no one knows that Charlon and the Magonian Chieftess are on board in plain sight, plotting their takeover of Armania. Kingdom at Sea is collected together with parts 5 and 6 in King's Blood. 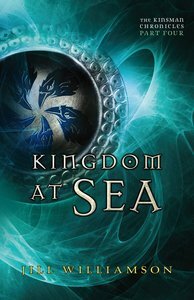 About "Kingdom At Sea (#04 in Kinsman Chronicles Series)"
Jill Williamson is a novelist, dreamer, and believer. Growing up in Alaska led to a love of books, and in 2010 her first novel, By Darkness Hid, won the Christy Award. She loves working with teenagers and gives writing workshops at libraries, schools, camps, and churches. Jill lives in Oregon with her husband and two children. Visit Jill online at www.jillwilliamson.com. Customer Reviews For "Kingdom At Sea (#04 in Kinsman Chronicles Series)"
Like the earlier books in the Kinsman Chronicles Series, this novel has left me hungry for more. As soon as I get the chance to get my hands on one of Jill Williamson's books in the series, I can never put it down. Whenever I start reading her books, I keep going until I get to the end and before I know it, it's past midnight :). As per usual, I thoroughly recommend reading the series; it's really an intriguing journey and story in a fantasy realm that also seem to have underlying, symbolic implications of certain places or prophecies found in the Bible. I honestly cannot wait to read the following books in the series.